Chukyo University, a well known private university in Aichi, Japan, has two distinct campuses: the Nagoya Campus and the Toyota Campus. The Nagoya Campus, located in the city of Nagoya, is a large and attractive industrial city on the Pacific coast, midway between Tokyo and Osaka. The city is Japan's third largest city and a vital center of industry, commerce, and culture. 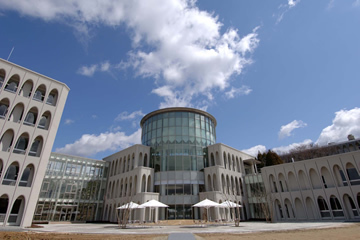 Most international students study at Nagoya Campus. The city campus has a high concentration of students and is distunguished by its grand scale in a hilly area in the eastern part of Nagoya. The university offers undergraduate courses in Schools of Economics, Business, Psychology, Mangagement, Law, Letters (the equivalent of Humanitites), and Engineering. Download the Outline for Exchange Student Program.pdf for information on studying at Chukyo in the Fall 2019-Spring 2020. UMass Boston undergraduates take Japanese language courses along with courses taught in English in liberal arts and management. More than 20 courses are regularly offered, from beginner to advanced level. This exchange student program is particularly well-suited for Communications, Political Science, History, Japanese language and Asian studies students. Please scroll down to "Course Transfers Reference Table" to see how courses from Chukyo University transferred to UMB. Spring semester: March - late July. University of Massachusetts Boston students only. Undergraduate, graduate, and post graduate students who have currently completed at least one year of full-time study with the most recent semester completed at UMass Boston are eligible. Students are required to have taken one semester of college-level Japanese language at their home university prior to the beginning of the program at Chukyo. 2. Japanese language proficiency report (UMass Boston students are required to have taken one semester if college-level Japanese language prior to the beginning of their exchange). Information on the Bridging and Morgan Stanley scholarships to study in Japan and downloadable application forms are available at AATJ's Web site: http://www.aatj.org/studyabroad/japan-bridging-scholarships. "Scholarship for foreign students in Chukyo University" is available for the exchange students. Students can apply for it only after arriving at Chukyo University. The amount of scholarship: 45,000 yen per month. The number of scholarship recipients varies depending on the term (e.g. 4 exchange students were awarded for Spring 2013). Students are selected based on a short essay on the application form and GPA. Off-campus housing. Single occupancy furnished studio apartments near Nagoya campus. It takes about 5 min. by metro or 20 min. on foot from the apartment to Nagoya Campus. Students are responsible for paying for rent 40,000 yen and the electricity fee, which costs approximately 5,000 yen per month. No meal plan is available, but studio include mini-kitchen with an electric stove, refrigerator, and microwave, and there are cafeterias on the campus.